If you enjoy knitting or crocheting (or would like to learn), we would like to invite you to join our Prayer Shawl Ministry. 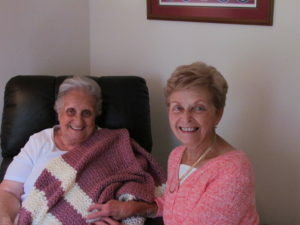 Wesley’s Prayer Shawl Ministry meets together to knit and crochet together to create shawls on the second and fourth Mondays of each month from 2:00 to 3:30 in the Wesley Garden Room. We pray as we knit and crochet together, sharing simple (or more challenging) patterns to create shawls to be given to those in our congregation (and beyond) who may need to feel God’s love and care. We pray for those for whom we are knitting or crocheting, and our shawls are blessed by our group and our pastors. If you are not able to attend on Monday afternoons and would like to knit or crochet prayer shawls on your own, we welcome your shawls. Please drop them off at the church or talk with Phyliss Clay. This ministry at Wesley began in July 2007, and we have created and given out over 750 shawls! Each shawl has a story, and we are often amazed at how God is working in and through this ministry. If you do not knit or crochet, but would like to contribute to our ministry, we also welcome donations, so that we can add to our supply of yarn and supplies. Come join us for a blessed time of prayer and creativity as we reach out to those in need of comfort and hope. Questions? Contact Phyliss Clay or call the church office.